SCONE SPY is rushing to get to Edinburgh’s Waverley Station when a wee somewhere catches my eye. Eteaket. It’s a cafe on Edinburgh’s Frederick Street. Somehow I’ve never spotted it before, though I must have wandered up and down this street at least 100 times. Hmm. Should I rush for the train I planned to get, or stop for a little scone sleuthing? I think we know the answer to that one, don’t we? And luckily my companion takes next to no persuasion. It’s a dinky little place. We park ourselves at the only spare table. Little do I know that there’s actually another section through the back. It’s got squashy sofas and a cosier feel. If you fancy a visit, go for this room if you fancy some real r ‘n’ r.
There’s an elderly gent in there and he spots me checking it out later. “I’m hiding from the rain, and spoiling myself with cake,” he says. He’s not daft. The front section, though, is perfectly pleasant. I like the bright seating and the slightly retro feel. And it’s lovely to see tea here being served in individual teapots, with vintage china cups and saucers. Makes all the difference, don’t you think? They love their tea here as much as I love a scone. There are an unbelievable amount of teas. Dozens. They love their cuppas so much that there’s even a selection of tea cocktails. I’m quite tempted by the Perfect Peppermint Mojito. But I know what I like and I like what I know. I’m a traditional soul at heart and I opt for a pot of Breakfast Blend to go with my cream scone. I’m thrilled when my chosen teacup and saucer is blue willow pattern. My dear old nana loved blue willow and I raise a cup of my Breakfast Blend to her and have a wee smile at the memory of endless cuppas and Gypsy Creams with her. Of course, the tea is a main event here. While others plonk a teabag in a pot, here you get loose leaf tea, a tea strainer and even an egg timer to make sure your chosen cup is brewed, not stewed. At one stage I’m all fingers and thumbs and make a hash of the tea strainer. “Coping there?” smirks my companion as he enjoys a black coffee. As for the scone itself, it’s lovely. Fruity, nice dish of cream and pot of jam. It makes me so glad I stopped. My companion enjoys a hearty BLT sandwich, as good as can be. When we leave, there are two American tourists perusing the menu outside, wondering whether or not to go in. “Go right ahead – and make sure you have a scone,” I say, at which point my companion pretends he’s not with me and slopes off. 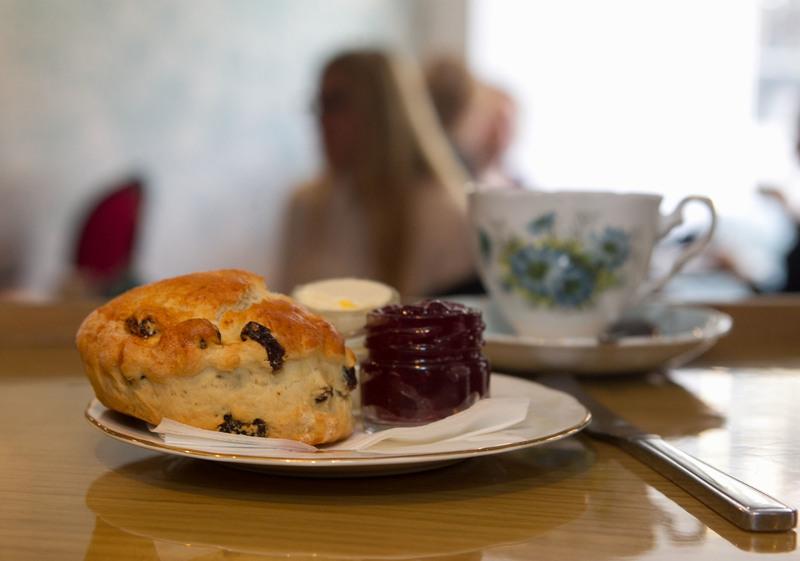 Looking for a scone near you? Browse our map of reviews below!